Hereunder a photograph taken by my grandfather during the battle of Verdun in the beginning of march 1916: the graves of 2 german airmen died on the 26th of February 1916 at the very beginning of the battle. 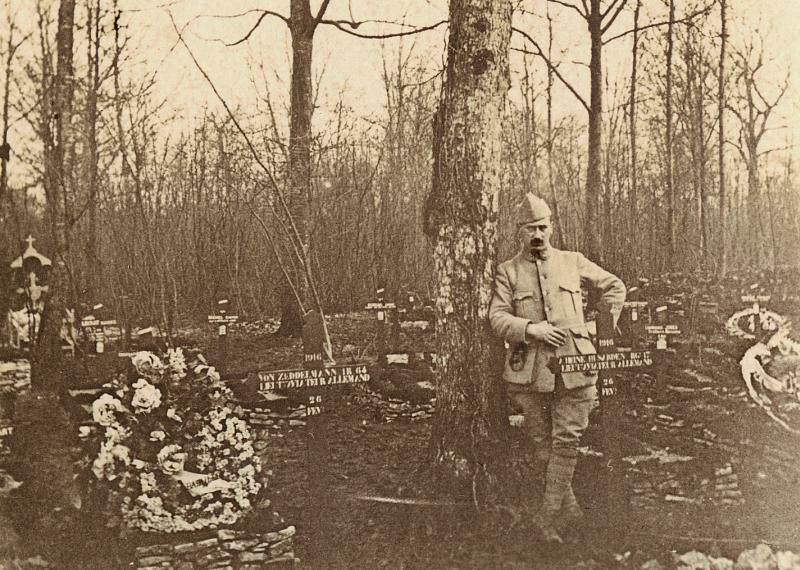 This cemetery was located in the forest of Sommedieue, south/east from verdun. I know that these 2 airmen were fired over the city of Dieue by the french fighterace Jean Navarre. Is it possible to get more information about these 2 german pilots, the reference of their plane ( a 2 seats cabin), as well as the conditions of this air-fight over the sky of Verdun ? 1st picture, view of the cemetery in the forest of Sommedieue. Ltn. Georg Heine, Hussar Regiment 17 (HR 17). Ltn. d. R. Alfons von Zeddelmann, Infantry Regiment 64 (IR 64). They flew for KG4, KaSta 21. 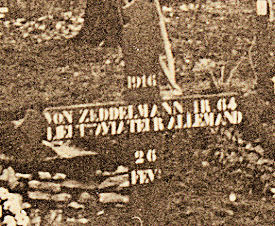 Please find the detail of the grave of Lt von ZEDDELMANN and under his name, written in french " Lieut. AVIATEUR ALLEMAND"
For the german flight, what means KG4, KaSta 21 ? Is it the name of the plane ? No, that's not the type of aircraft. That's the name of the unit. KG 4 (Kampfgeschwader 4) former KagOHL 4 (Kampfgeschwader der obersten Heeresleitung 4) means something like "combat squadron 4". KaSta 21 (Kampfstaffel 21) means something like "combat wing 21" or so. Their plane was shot down over Dieue-sur-Meuse. and Heine in block 2, grave 139. I prefer to live in peace. Not in pieces. Thank you for this interesting information. 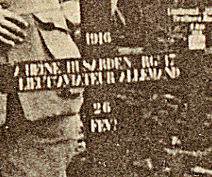 On the cross from Lt Heine, what can you read after his name HEINE ? Is it HUSARDEN or something else ? On the second row what is written in french is Lieut AVIATEUR ALLEMAND or in english Lieutenant german airman. This provisory cemetery was a mix of german and french graves. Unfortunatly I can't read well what's written on the cross. He fought in France with this unit until March of 1915.
was no such a thing as an airforce uniform.